Last year, this Venn diagram circulated the channels of higher-ed circles. It poked fun at college websites and the designers who seem clueless to the type of information prospective students want or need. Like girls under trees. So many girls under trees. Being greeted with a nice photo of a winsome young woman is nice, sure, but how useful is it, really? More useful than displaying the school's address or phone number? 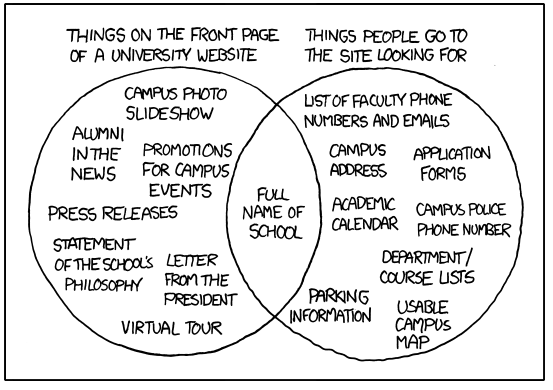 Taking the diagram as a starting point, two law school librarians have ranked the usability of 200 law school homepages, according to a set of criteria they believe are most useful to site visitors. They took into account a mix of design patterns & metadata, accessibility & validation and marketing & communications standards. Points were deducted for girls (or boys) under trees.